Iraq war veteran Taylor Winston became a hero on the night of the mass shooting in Las Vegas after he used a stranger's truck to rush critically wounded victims to the hospital. Now he has a new truck of his own. An Arizona car dealership rewarded him Monday with a free, customized Ford F-150 in appreciation for his bravery and quick thinking on 1OCT, when Winston made two trips to the hospital while officials scrambled to get ambulances to the concert venue. He credited his military training for helping him keep a "cool head." 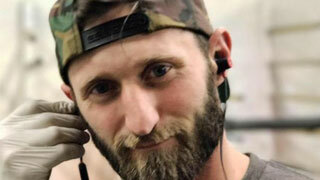 "Most of us would have ran and never came back," Shane Beus, owner of B5 Motors in Gilbert, Arizona told CNN. "His military training allowed him to think in a split second what to do." "It was still quite scary, but we just knew they (the victims) had to get to the hospital immediately," Winston told CNN's Anderson Cooper last week. "No ambulances were immediately available. There were far too many casualties for anyone to handle." B5 Motors put out a social media blast last week to find Winston, who lives in San Diego. About seven hours after their tweet plea, they announced they had made contact with him. Beus said the dealership selected the F-150 but gave Winston the opportunity to choose between the used truck and two other vehicles in the $20,000 price range. The dealership posted a video Monday to Facebook Live showing Winston being handed the keys to a silver truck and driving away in it as onlookers applaud. "My message is that I hope people will recognize the heroism in him and others and become selfless," Beus said. "It's kinda what America is about, helping others."